Today, we are going to give an unbiased review about Wondershare DVD Creator. The review is based on our practical trial and test on this program, to share its advantages, disadvantages, killer features with our readers. Also, there is a detailed description about free trial limitations or how to use Wondershare DVD Creator on Mac or Windows PC, even its alternative when it fails to work. What is Wondershare DVD Creator? Wondershare DVD Creator is a DVD tool to burn, edit and customize DVDs from 150 different media formats, including video, audio even images, into DVD, DVD folder, Blu-ray DVD folder, ISO file and Blu-ray disc. Speaking of its developer, Wondershare Technology, it is a global leader in the field of application software development. Wondershare also involves itself in the business of productivity tools, multimedia tools and utilities, which has won it a wide recognition from users. And due to its expertise and good fame, it is absolutely safe and convenient to use its DVD Creator. In the following review, you will figure out when and how to utilize this tool for your intentions. Wondershare DVD Creator is quite suitable for those users who only have basic needs to customize a DVD output and more likely to burn files within 400MB. For users who need advanced tools to make their videos quite professional looking, they may need to find another dedicated program. Wondershare DVD Creator is now available for both Mac users and Windows PC users. Also, there is a free trial offered before users decide to buy a license. Though Wondershare DVD Creator offers free trial, the features are limited. Which for Mac version and Windows version, the limitations will be a little different as following. The installation of Wondershare DVD Creator is quite easy. Users just need to go to its official webpage for downloading the installer, which is with a size of approx. 65MB, but the complete installation will require at least a space of 170+ MB. So, before downloading and installation, make sure there is at least 200MB free space on your computer. During the installation, you will be guided to view its agreement, say Agree to finish the installation. The interface of Wondershare DVD Creator is quite simple and neat, also the stylish icons and toolbars make users feel comfortable. According to above, we notice that Wondershare offers a fast way for DVD burning, also allows users to save last project if they quite during the process to burn DVD. Also, the main interface will show users how this program works to burn a DVD by listing Source>Menu>Preview>Burn sequentially. With the ToolBox, users can switch between 3 main features that Wondershare accommodates. Also, as we tested, the importing of a video to the program processes fast, but the uploading time still depends on the size of imported videos. Effect: There are 17 effects can be added to the video (Holiday, September, Snow, Aibao, Chocolate, BWFilter, Simple, Retro, Glow, RainDrio, FuzzyImg, Sandra, Bubble, Vignette, 70s, Sunset, BlueTears). Users can also tweak the brightness, contrast, saturation, volume, etc. Watermark: there are 2 types of watermark, an image or some texts. Subtitle: Users can import subtitle to the video, even customize it. Another convenience Wondershare brings to its users is the real-time preview under the editing mode, users can understand the expected effects by comparing the original and output videos. In Wondershare DVD Creator, there are 123 menu templates in 8 types: Memory, Holiday, Travel, Wedding, Sports, Movie, Standard and None, some are static and some are dynamic. In addition, users are allowed to make changes on these templates, but only to some extend. For example, users can add cover image, add background music, add texts, even modify the text in the original template. For users who are using Wondershare DVD Creator free trial, as we mentioned above, only 3 menu templates are available, the others require a paid license. Even , on its official website, there are extra menu templates offered free, once you have been a subscribed user of this program, you will be directed within the program to download more templates and install for your use. For sure, Wondershare DVD Creator offers a bunch of feature to satisfy the users, but when talking about the crucial reason to persuade users into a purchase, the burning performance is absolutely the key. And here we will talk about the burning performance in 2 aspects, the speed and quality. In my test, it took 3 minutes to burn a 48-MB MP4 to DVD, and during the burning, it paused a while. While I added a 348-MB MP4 for burning, it took about half an hour to finish the burning. Also, there was a crash when I cancelled the burning due to no response from the status bar for a long time. Anyway, the burning speed is acceptable. If we grades the burning quality of existing burning programs in the term of A/B/C classes, the burning quality of Wondershare DVD Creator ranks in the B class: the burning quality is satisfactory but still needs to improve. And according to our tests, the burning quality is substantially up to the original video quality. Also the effects you added to the video will influence the final output a little. So, that’s to say, if you want high burning quality, make sure you are importing a high-quality original and use an appropriate effect or template for your DVD output. Not all the DVD Creators can burn images into DVD, but Wondershare DVD Creator can. Its Photo Slideshow feature enables users to burn a series of photos into DVD. Also, users can edit the photos for burning, such as setting a transition, adding text or background music. This feature is particularly convenient for users who want to show and share their family photos on special events. Wondershare DVD Creator Tutorial: How to Use? Now, we are going to show how to use Wondersahre DVD Creator. Since it has both Mac and Windows versions, here we take “Burn MP4 to DVD on Mac” as an example to give a tutorial. If you are a Windows user, it is OK to follow this tutorial, because there is little difference from that on Mac. Step 1Download and install Wondershare DVD Creator on Mac. Step 2Choose “Create a New Project”. Step 3Drag and drop MP4 video to the program. Step 4(Optional) Click on the editing icon, use the editing tools to customize your videos. Step 5(Optional) Choose menu template for your video, also you can modify the text. Step 6Preview the video before burning. Step 7Click “Burn” toolbar to choose an output format and other settings, then click the red “Burn” button to start the burning. What if Wondershare DVD Creator Fails/Won't Work? Of course, there are possibilities that Wondershare DVD Creator fails or won't work in your case, just like me, I ran into a crash just now. Then what to do? You can try following solutions. This is always the easiest way to recover from a failure. Just quit or force quit the program, then re-launch the program to add files for burning. If the failure appears, go to solution 2. This is always the most efficient way to recover from a failure. Just uninstall the program by moving the app to trash. To guarantee a successful reinstallation, you are recommended to go to Trash Bin and remove the app permanently, to delete all data generated from the app. Then, go to its official website and reinstall the program. If above mentioned 2 methods don’t work, you will need to try another DVD Creator for the DVD burning. Cisdem DVD Burner is worth a try. It is a mac program designed to burn standard and HD videos to DVD, DVD Folder or ISO file. Also, with a video editor, it allows users to edit the video (rotare, crop, add effect/music/watermark/subtitles, etc.). WinX DVD Author a free DVD burner to create DVD from all kinds of videos on Windows PC. From latest Windows 10 to earlier Windows XP, WinX DVD Author offers an outstanding support on Windows platform. It is free but fully featured to burn a DVD, but the shortage lies in that there will be less menu templates, no effects, and limited editing tools to customize your videos before burning. Therefore, according to our review on Wondershare DVD Creator, it is worth a try. 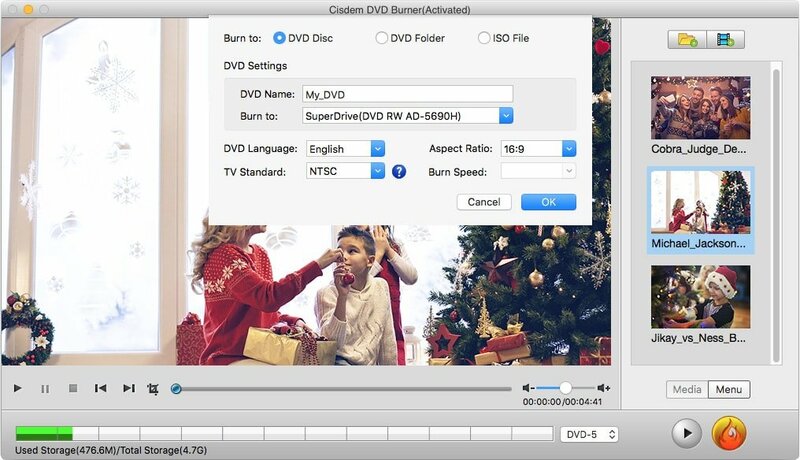 With its simplicity and multi-functionality, users can burn videos to DVD easily. But if you are still hesitate to pay for it, try other DVD creators on our recommendation list to make your best choice. Convert video, rip DVD, and download online videos. How will you preserve and share your best memories of this Easter? Actually, it couldn’t be better than burn easter video to DVD which can be played on TV with a DVD or VCD player and be sent to others as presents, or just back up forever. 10 Must-see Easter Movies for Families! Vote For Your Fave! After you traditional easter dinner of ham, lamb, or chicken, enjoy this Eater with a good holiday movie. These family-friendly flicks are some of the best easter movies of all time. How to Add Music to Video on Mac(Virtually Any Videos)? Do you want to add background music to your home videos or customize the videos you download from online? Here’s the best solutions to add music to your videos on mac and make it special.